A great headline can mean the difference between a click and an impression — that’s why it’s so important to create them strategically. 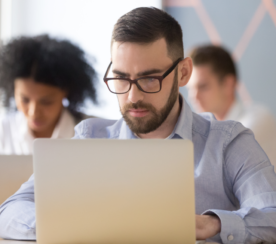 If you’ve ever found yourself struggling to craft the perfect headline for the article, blog post, or web page you’ve spent hours (if not days) working on, I’m here to help. As a journalist-turned-content-strategist, I’ve written at least 1,000 headlines. 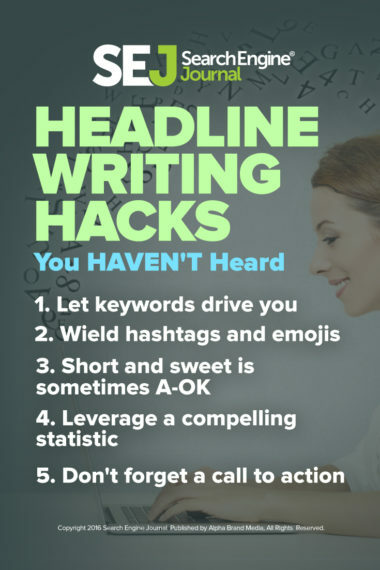 Here are 13 headline writing hacks I use to come up with headlines that spark interest and inspire clicks. 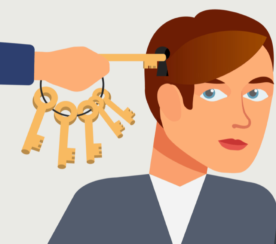 TL;DR → Don’t sacrifice keywords to be clever. Writing a headline as a digital marketer is more complicated than writing a headline as a traditional journalist. In my former life as a traditional journalist, I didn’t have to think about keywords. Sure, I had to get to the point and be interesting, but it didn’t involve keyword research. When I started as a content strategist at Bruce Clay, Inc., all that changed. 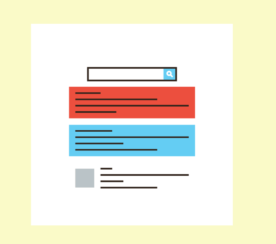 Now headlines, if not entire articles, were crafted around a keyword or keyword phrase. My inner Lois Lane cringed. I wanted to be clever. I wanted to use a pun. I wanted to play with words. I didn’t, ahem, want my creativity stifled. A few articles in, however, my perspective changed when analytics data showed massive traffic to articles that definitively rank for their focus keywords. After seeing these things, I was willing to forego a pun or clever turn of phrase if it meant increased traffic. My tried-and-true tools for keyword research are the Google AdWords Keyword Planner and KeywordTool.io. The Keyword Planner shows you search volume, and KeywordTool.io gives you suggestions for keyword phrases based on Google autocomplete. As for emojis, they can actually boost engagement when included in a headline. Even USA Today has experimented with them. Tech reporter Virginia Nussey recently titled one of her articles: Millennials ❤️ Snapchat: 15 Tips on How to Use Snapchat for Business. That heart emoji really makes the headline pop, especially when it’s being mentioned on social media. 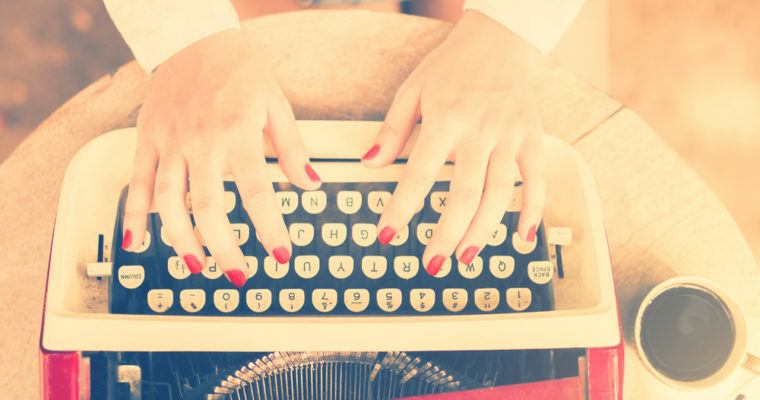 Did you know Upworthy columnists write a whopping 25 headlines per story? That’ll give you options. Why limit yourself? Go wild. Sometimes we overthink. Sometimes we need to get straight to the point. Not every headline is a sonnet, nor should it be — especially if your content is particularly serious. A quote, especially from a celebrity or influencer, can be excellent fodder for a headline. The quote, of course, should be on-topic with the article as a whole. Unlike body copy, quotes as headlines should always appear in single quotations, according to Associated Press Style. If there’s a gem of a quote, but it’s too lengthy to serve as a headline, you can shorten it by omitting unnecessary parts and replacing them with ellipses. You can also change the tense of a word or replace “it” with the needed noun by using parenthesis. Similarly, you can include a really powerful statistic right in the headline. Recently, I wrote about the rise of voice search and how to optimize for it. While the material I had to offer was brand new, the subject itself has been a little run into the ground. Here’s what I made the headline: Learn How to Optimize for Voice Search NOW: More than Half of Queries will be Voice Search Queries by 2020. Including the statistic gave readers information they were actually going to get in the article gives them a tantalizing taste of what’s to come. Pro tip: don’t ramble. Sometimes people try to pack too dang much in the headline and it’s practically a run on sentence. Or maybe you have two key points you want to make and you’re having trouble synthesizing them into a single headline. Enter the colon. It’s the piece of punctuation that gives you two headlines for the price of one. See a real life example in the H2 below! Are you bored reading your headline? Chances are your audience will also be bored. What would you like to read? What would entice you? Don’t settle until you write a headline you’d be intrigued by. Don’t copy them, of course. As with anything, however, looking at what your successful competitors are doing can help you shape your own strategy. In addition to inspiration, you can also look at other headlines to help determine SEO choices. Use the SEOToolSet, for example, to evaluate top-ranking articles’ headlines for word count, reading level, keyword inclusion, etc. This will immediately give your headline a sense of immediacy and urgency. I like to use this occasionally to punch a headline up. Use this sparingly, however. It’s not for every article, every time. What questions does this article answer? The question itself can sometimes make for a good headline. Consider, for example, this article: What Is the Facebook Algorithm? That is exactly the question that the article answers. It’s simple and it works. Consider throwing in a call to action in the headline itself. That never hurts. Use terms like discover, learn, find out, understand, etc. to make your reader feel like they’re making an empowered choice. Studies have shown including a number in your headline drives clicks. Note: the Associated Press states that headlines beginning with a number should spell out the number. You’re also supposed to spell out numbers one through nine, including nine. Online, however, where attention spans are short and space is precious, numerals rather than spelled out numbers tend to perform better. It’s still good to know the rule, though, even if you’re going to break it. 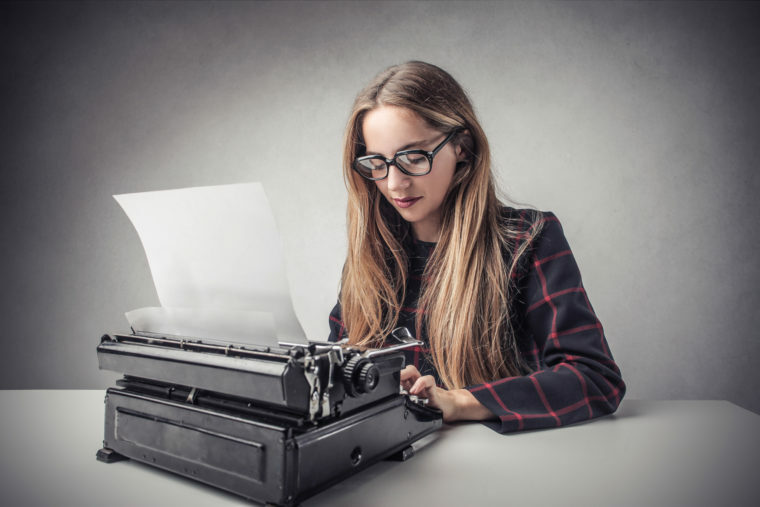 Got your own headline writing hacks to share? Comment below or tweet me @KristiKellogg!